Ronald Davis put back an offensive rebound with one second remaining to send the #7 seed Banner Boys on to Round 2 with a 61-59 victory over the #10 seed Jackson Underdawgs. Dylan Page had 16 points and 11 rebounds for the Banner Boys, who survived in a back-and-forth game that had six ties and 11 lead changes. 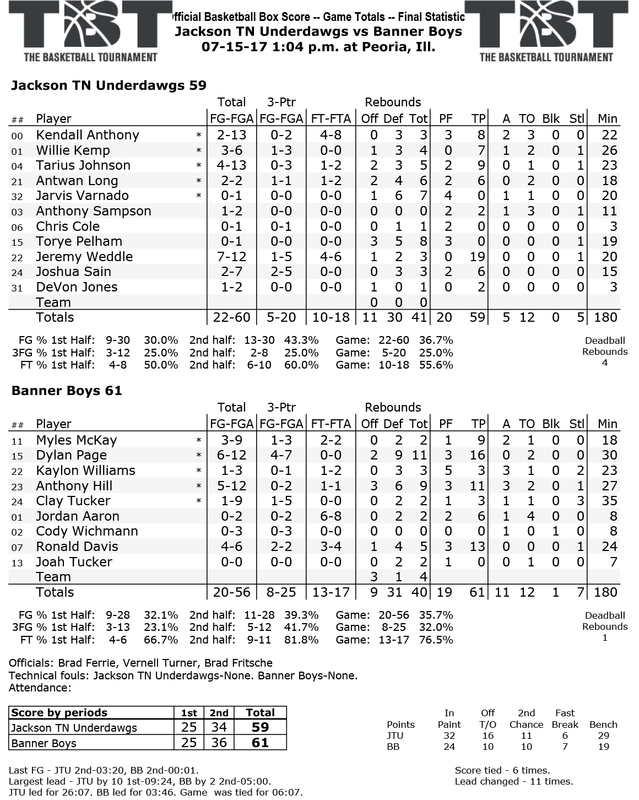 Jeremy Weddle led all scorers with 19 points on 7-for-12 shooting for the Jackson TN Underdawgs, who were unable to replicate the magic from their 2016 stunning win over the top-seeded Bluegrass Boys, the only time in TBT history that a top seed has been defeated in Round 1.